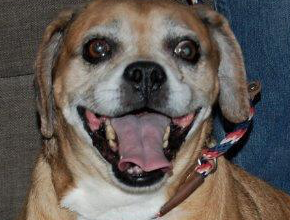 Our Pet Pick, Thomas, is a sweet and smiling 12 years young Pug Beagle mix. He loves getting treats and going for car rides. Thomas does have diabetes and takes two insulin shots like a champ! He is capable of living a full and long life under the care of a compassionate and devoted forever family. Thomas can be a bit bossy with other dogs, so as always, please bring any other dogs and mature kids with on your meet and greet with Thomas.